Yes, seaweed is healthy and it has a lot of health benefits and makes wrinkles wait just a little longer. Seaweed is full of iodine. A mineral that is very important to be able to function. Your thyroid gland ensures that everything stays in your body. It produces very important hormones that keep your heart function, metabolism and body temperature up to standard. 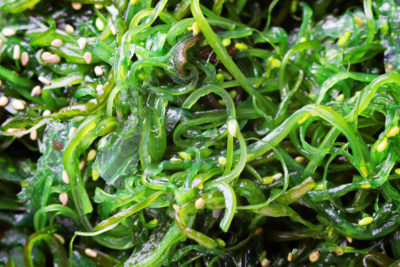 On average, a gram of seaweed contains five to fifty times more iodine than you need on a daily basis. That there is a lot of iron in spinach, you probably already knew. Seaweed contains even more. Iron is very important for humans. It transports oxygen through your body. Iron deficiency can cause anemia. 100 grams of kelp contains 2.9 milligrams of iron. A steak 1. And good for your skin! Furthermore; It contains al lot of antioxidants. It protects your skin from aging. That is why seaweed is used in many luxury skin products.